The South Carolina House of Representatives voted early Thursday in an overwhelming majority in favor of a senate bill to remove the Confederate Flag displayed at the state's statehouse. Calls to remove it were reawakened after the massacre of nine African-American Protestants who were holding a Bible study at their worship edifice. The shooter, Dylann Roof is seen on photos holding the Confederate flag which is often used as a sign of White Supremacy. 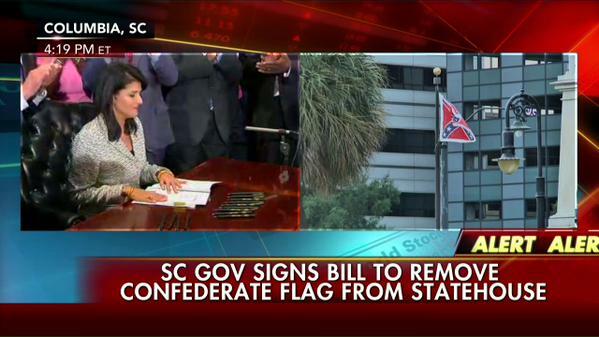 Governor Haley of South Carolina is expected to sign this bill into law immediately. 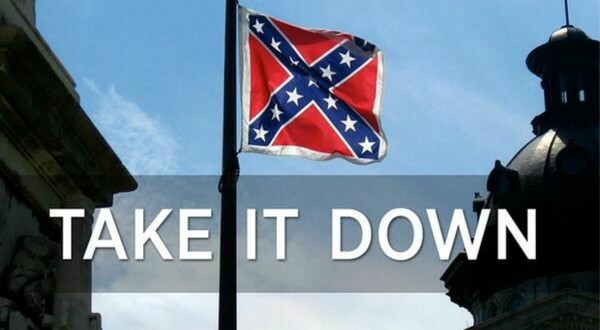 The Confederate flag may be removed today or possibly on Friday. Governor Haley of South Carolina has just signed the bill that will remove the Confederate flag off statehouse property. The governor used several pens to sign the bill. Nine of the pens will go to each of the families of the Bible study shooting, the others will go to other lawmakers. Haley said two were for herself. The flag will be removed on Friday July 10, 2015 at 10 AM EST and will be placed in a Confederate museum.